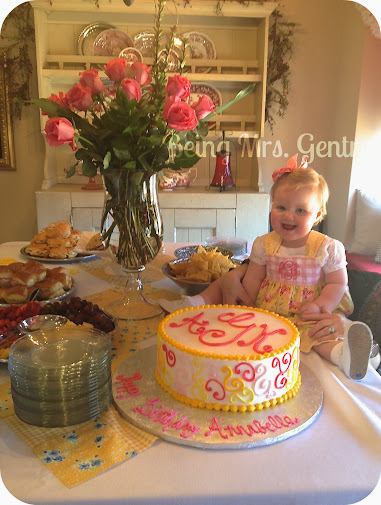 Today I wanted to share a couple of recipes I used for Annabelle's party. I used this recipe for chicken salad and really liked it. The onions in it made it different from others I've made before. It had almost a French onion taste, while still being chicken salad. I used grapes and left out the walnuts. Using a rotisserie chicken was genius. After de-boning it, I shredded it in my stand mixer with the paddle attachment. Both of these items combined to make the chicken salad a snap. For the party sandwiches, I made these that I've mentioned before. They're always a hit, so I keep on making them. I assemble them the night before, cover and refrigerate, then make the glaze and bake about 30 minutes before the party. They come out at the perfect time to be warm but not finger-burning at the start time. And then there was the fruit dip. I ran out of time to make the fruit dip because I forgot to set out my cream cheese, so I made it the day after. Otherwise, it takes approximately five minutes to make. So easy, and so incredibly delicious. Only three ingredients. 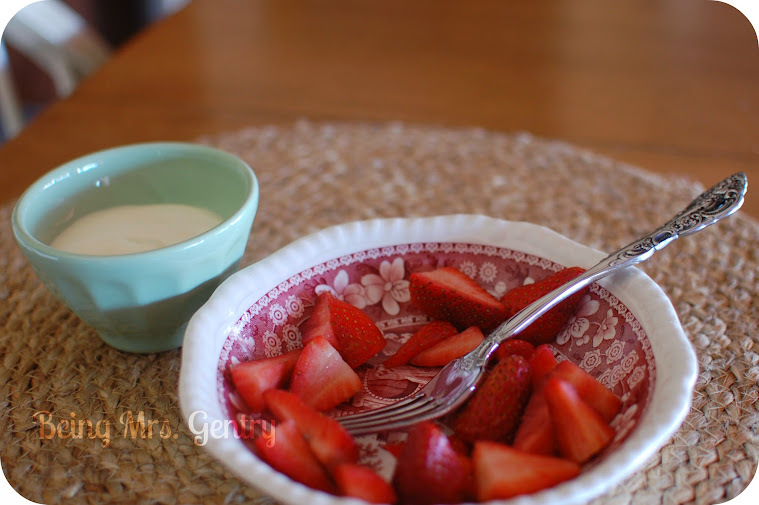 We ate it with a spoon when we weren't dipping strawberries in it. The week of my kids' birthdays, Smocked Auctions had a warehouse sale over in Dallas. If you're not familiar with Smocked Auctions, it started as a children's clothing company that primarily held an "auction" on Facebook each Thursday night starting at 8:30 PM. They expanded into Instagram selling, and during their warehouse sale, they announced the launch of their website, which now offers cute kids' clothes 24/7. So you can get your smocking fix anytime, of course. Back to the warehouse sale. Smocking? On sale? Local? What time should I be there?!? My sweetie girl and I headed over to Big D on the second day of the sale because that's when we were free. They didn't allow strollers in so she sat on my hip in her sling, leaving me mostly hands-free to shop. There were quite a few kids running around, so kids were definitely not prohibited, just the strollers. Even though it was the second day, I found plenty of cute things. 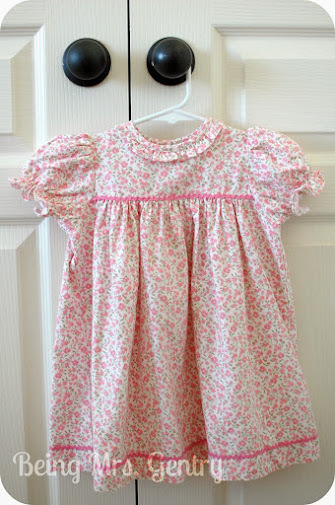 Smocked items were $29.99 and non-smocked were $19.99. They also had a few fine children's brands such as Florence Eiseman and Feltman Brothers priced separately (i.e. more than $29.99). I didn't come across any of these in our size. The actual birthday day dress. Perfect for spring and summer. I didn't shop far out of our current sizes (18 or 24 months, depending on the brand) since it was primarily spring and summer items, but I noticed they had quite a bit for older girls too (like through kinder-sized). I think they have a fall sale as well. It was definitely worth the drive to find cute boutique outfits for a deal. I would go again. A successful shopping mission for my girl and me! It's Spring Break here in Texas, and as such, we won't be going anywhere around Fort Worth. There are record breaking crowds in all of our favorite spots like the Fort Worth Zoo and the FW Museum of Science and History. We'll stay far from there. Spring fever is a real thing. Today it's got me dreaming of what I would do in our fair city if I had a mom's day out (and no spring break crowds)! Here's what I came up with--my incredibly self-indulgent dream day in Fort Worth. I would start my day with a later class at Pure Barre Fort Worth. Later, like 8:30 am instead of 6. If I don't get up early, I feel like I won't do anything but stay at the house in my pajamas. After barre, I would swing through Blue Bonnet Bakery for one of their delicious donuts and a diet coke. I love their cakes, but their donuts fresh out of the fryer are SO GOOD. It's located in a renovated church, and they've kept a lot of the stained glass windows and neat features. I half expect someone to hand me a church bulletin every time I walk through the doors. Since I'm staying close to Camp Bowie apparently, I would make my way back west to the Lemongrass Aveda Salon for a facial, massage, and pedicure. I've never checked them out, but today would be a good day to try it. Next I would head down to University Park Village and pick out a new sundress from Anthro and accessories, before stopping by McKinley's for half a chicken salad sandwich, chips, and a Dr. Pepper (because they don't serve diet coke, rude, but it's my excuse to get Dr. Pepper). After dining alone with a book (likely Pride and Prejudice), I would make my way back to my house for a nap. And of course my house would be totally picked up when I got there because this is my own imaginary day off. Let's be real. I'd miss these faces. At the end of the day, I'd grab my little family of four and head to Joe T's, where did I mention it's a perfect 85 degrees outside, and there's no line to get in the patio? We'll need two orders of fajitas because our kids eat so much these days, but it would be a fabulous evening under the Texas sky. I'm splurging on cheese and sour cream. Ahh, so fabulous. What's your favorite escape if you're stay-cationing in your town? 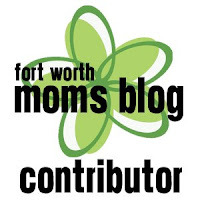 Next Mama Monday will be my kids' dream day in Fort Worth. Some of the links in this post are affiliate links. This means if you click on the link and purchase the item, I will receive an affiliate commission. Regardless, I only recommend products or services I would use personally! Happy shopping! I'm linking up with April, Christina, and Natasha, again today for another Five on Friday. Somewhere around the time I turned 30 and had children, the shorts I wore in my 20s all of sudden became gauche for the stage of life I'm in. One day they were totally respectable and modest, and the next day they were too short. Somewhere in there, I had two kids and just bought some simple basics to get me through that time period. I was either working or a few months post-partum and didn't give it much thought. Last summer's shorts don't fit, all for good reasons. Now here I am, figuring this out: in search of mom shorts. And actually, all of these shorts I picked out today are just great modest length shorts. If you're not a mom, don't run away. These seem incredibly long on the model, however, I do have a pair of them from pre-children. They were perfect for work events where a casual dress was too dressy, capris too granny, and a shorter in-seam was out of the question. They are truly light weight, and that's a bonus for the Texas heat that I'm praying comes SOON. This is such a happy color. I lived in these the last two summers, but my pairs are all too big. (Yay!) The nice thing about these is that they are loose to begin with, so you most likely can size down. Who doesn't love some good vanity sizing? They come in a bunch of colors, plus they go through the washer and dryer well. This is the same short, with stripes drawn across it and $5 more. Definitely cute if I decide I can handle stripes across the backside. That's where I will have to consult my mom. She'll give it to me straight. These are a little shorter, but I thought they were so cute, and KNIT! They sound so comfy. Very lightweight. I can imagine these would be good on days where we play outside a lot. I bought two pairs of these last summer before going to church camp with our students because I thought they were a good length. And they were, but they shrink a bit, so buyer beware. Lightweight, great price point, many color options. A little bonus to my five, for my mommy friends who like to spend their summer days in these Nike Tempos. Who wouldn't? They dry quickly when someone spills bubbles all over you (again). 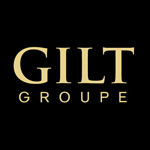 This site has great prices on them! 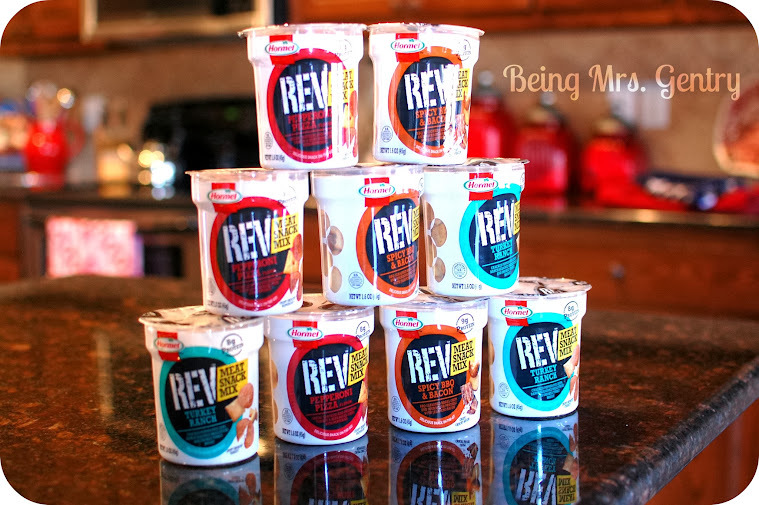 Recently I partnered with the Hormel REV Meat Snack Mix Blogger program. They provided complimentary product in exchange for my review. All opinions, as usual, are my own! 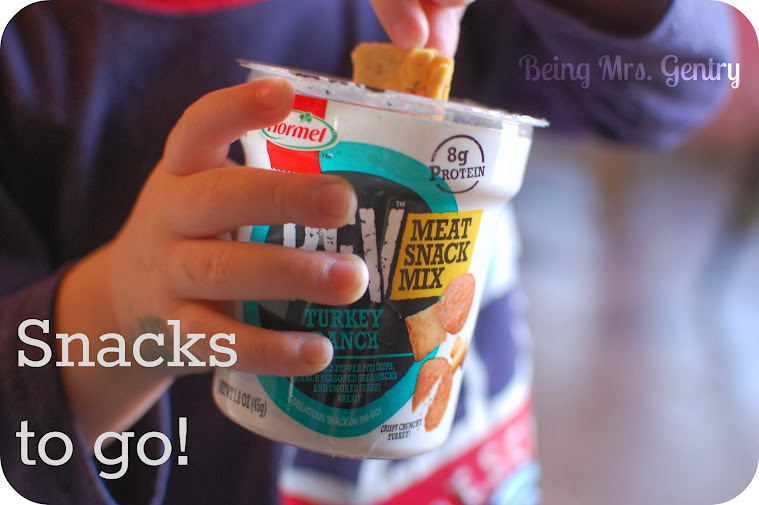 Let's talk about Hormel's Meat Snack Mix. If there's any meal of the day that I can get behind it's SNACK time. We're on the go so much between between our commitments, our fun, and our fun commitments that having a conveniently packaged snack that isn't all carbs caught my attention. The snack mixes are made with real meat and totally portable--meaning no refrigeration is necessary. Each contains 12 grams of protein or more. The day I received the package in the mail, we were headed out of town with a bunch of teenagers, one who had just come from a tennis tournament. I passed out a couple of them, and they were devoured in minutes. I told them I would be blogging about this and asked, "Would you recommend it?" They gave the thumbs up. In my current life stage though, obviously my little people are my main concern. I handed this over to my son and let him go at it. He loved it! Between the container it came in being personal sized, and the treats inside, it was a winner. We tried 3 flavors: Pepperoni Pizza, Spicy BBQ and Bacon, and Turkey Ranch. My fave was Pepperoni Pizza. Currently they're only available in Kroger stores in DFW and select Smith's stores in the Salt Lake City Area. 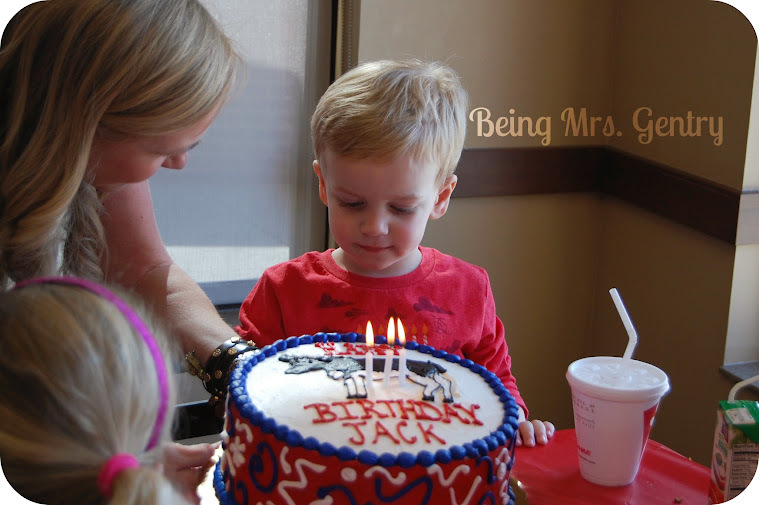 I wanted Jack to feel like he got a big kid birthday party compared to Annabelle's at home. I thought long and hard and realized that it's considered a treat at our house if we dine in and play on the play place at Chick-fil-a. We normally hit the drive-thru on our way home from somewhere else. So, to party and play inside Chick-fil-a was a big winner. This boy is growing up so fast. We're so proud of him and of how much he's growing and learning. He was a wonderful two-year-old. Even with all the changes we had at home this past year, he took it all in stride. I can't wait to see what his third year holds. I love him so much! More people showed up than I expected, but it was easy enough to add a few more kid's meals. They all had a great time playing in the play place, which is perfectly geared for kids his age. One exit and easy to watch them all while parents visited with one another. 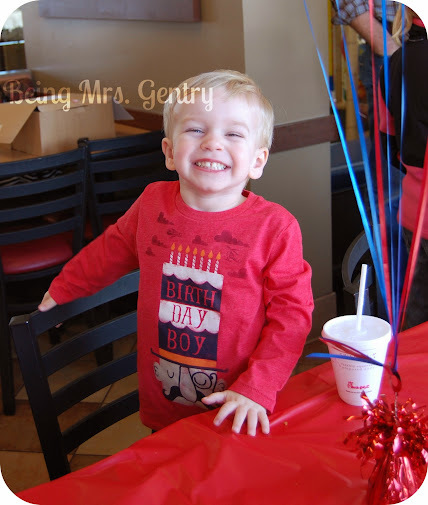 He had a blast! His invitations were done by 3 Little Monkeys Studio on Etsy and printed by MPix. She also did the favor tags, which I printed at Office Depot on 100 lb card stock. I thought CFA lended itself well to a western theme because of the Cow and chicken. 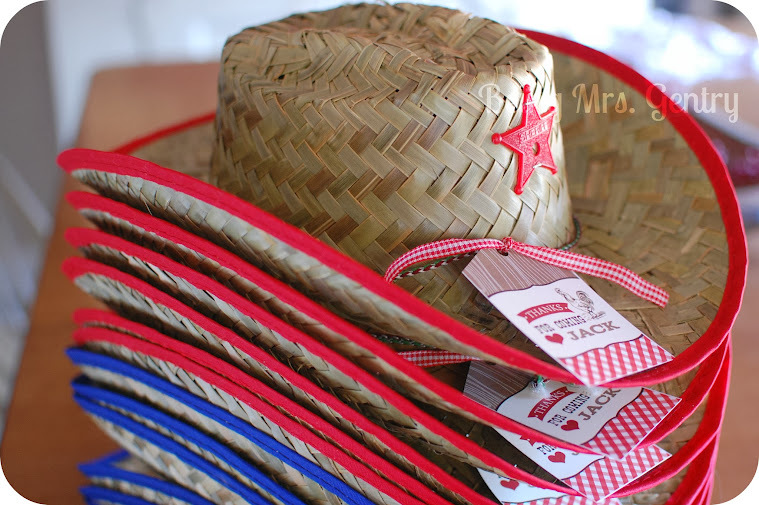 Our favors were cowboy hats. 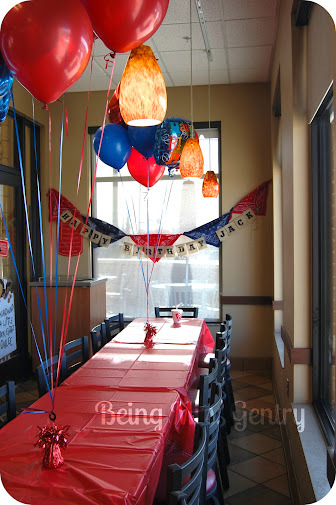 I want to say a lot about throwing a party a Chick-fil-a here, because I didn't find much online when I googled it. Our local store has party packages, customized to the number of party guests and the number of nuggets you want in the kid's meals. The package even includes nugget trays, fruit trays, and tea for the parents attending. SOLD. The Cow made an appearance for an extra $10. Can't beat that! They invited me to drop off any party decorations the night before, and their wonderful Marketing Coordinator had my banner up and tablecloths out before we arrived. All we had to do the morning of the party was show up with balloons. She even unloaded those from my car and placed them on the tables! She also kept the pace of the party going, getting drinks for each child, letting me know when the Cow was coming, time to open gifts, and eat. It was so nice to have someone else watching the clock. By the time it was over, she already had leftover cake, nuggets, and fruit boxed up, my cake knife and server washed, and the trash was cleared away. It was all done while I was thanking people for coming and passing out favors. In short, it was awesome. 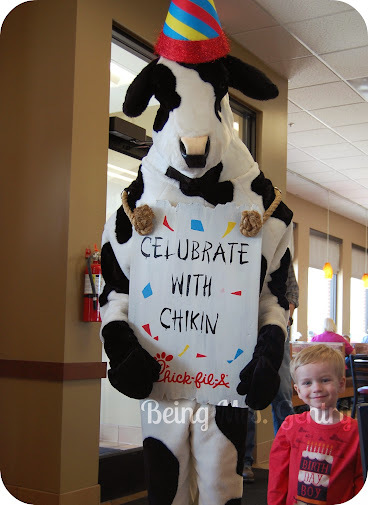 If you've ever dealt with Chick-fil-a, you know that everything is "their pleasure." They are absolutely fabulous at Customer Service, and this was no different. Our experience was so good that I sent a hand-written thank you to our local Store's Owner, complimenting his staff on a fine job. Note: I was not compensated to say these wonderful things about Chick-fil-a. I just really appreciated their service. 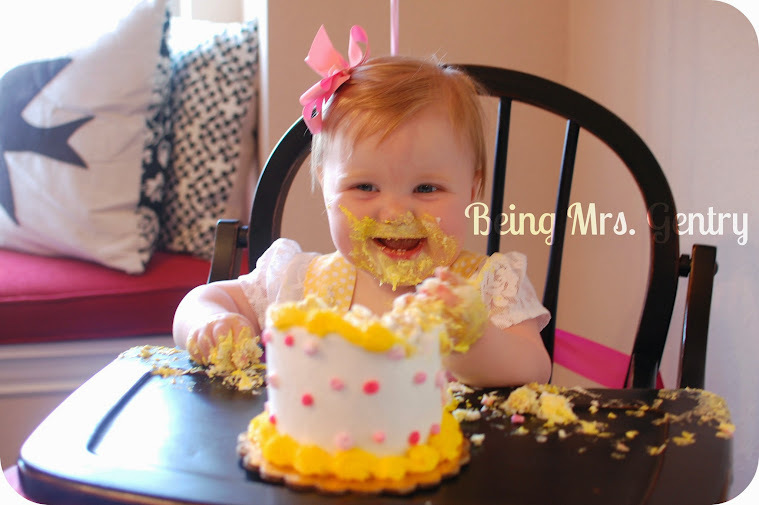 Our sweet daughter turned one last Friday. Her party on Saturday was the culmination of a two week sprint of celebrating birthdays, since our son turned 3 just two days before her birthday. As the chief celebration officer of our family, I am tired. Of course, it was worth it. 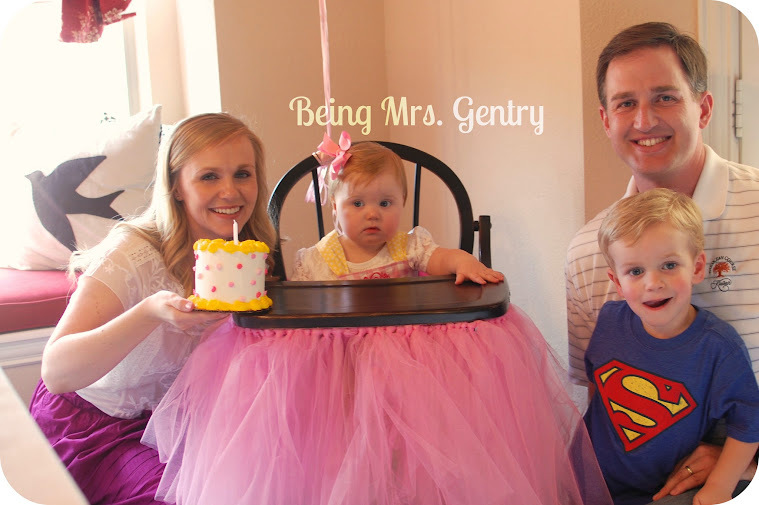 Her party day was blessed with beautiful, blooming spring weather, as gorgeous as the blessing she is to our family. 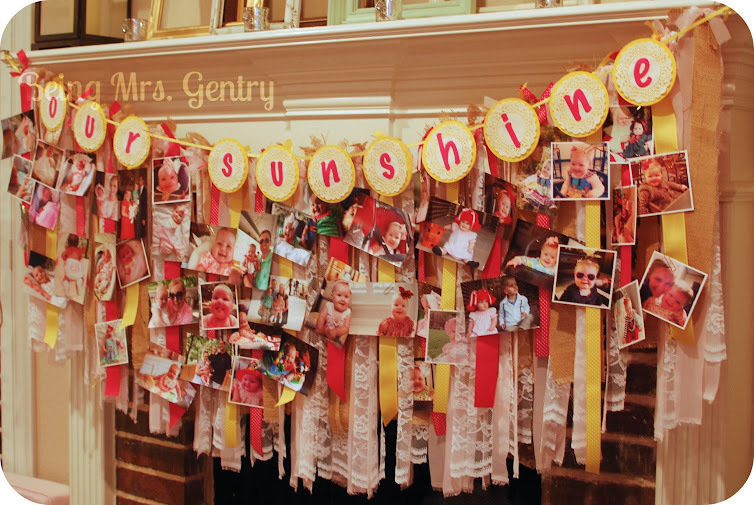 We did a "sunshine" theme, although I didn't expand on it as much as I could have. It was a wonderful celebration, regardless. Pink and yellow were mostly what I went with. The menu was chicken salad sandwiches on split croissants, party sandwiches, cookies, fruit, chips and salsa, and of course, the main event -- birthday cake! 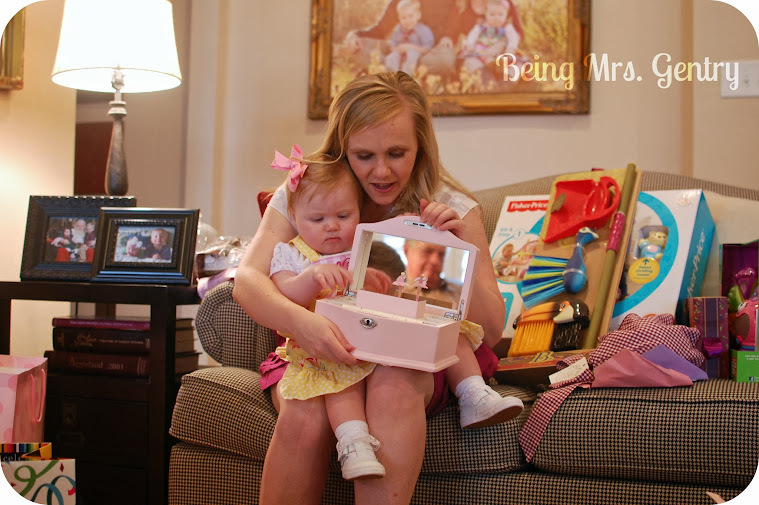 My parents gave her that jewelry box, which went well with our gift to her. We started her a James Avery charm bracelet with the birthday cake charm. She won't wear it for a while, but we thought it was perfect for this milestone.